yrh and draw through all loops. into dc, * rpt from * to * to end. Turn. Next Row - 1ch, 1dc into base of 1ch, * 3cl’s into 2ch space, 1dc into tr, * rpt from * to * to end, working last dc into top of 3ch. Turn. * rpt from * to * to end, working 1tr into last dc. Turn. Next Row - 1ch, 1dc into base of 1ch, make 1ch, * 3cl’s into 2ch space, 1ch, 1dc into vst, 1ch, * rpt from * to * to end, working last dc into top of 3ch. Turn. Pattern Row 1 - 4ch, * (1dc, 2ch, 1dc) into centre cl of the 3cl group, 1ch, vst into next dc, 1ch, * rpt from * to * to end, working 1tr into last dc. Turn. Pattern Row 2 - 1ch, 1dc into base of 1ch, make 1ch, * 3cl’s into 2ch space, 1ch, 1dc into vst, 1ch, * rpt from * to * to end, 1dc into 3rd of 4ch. Turn. Continue with Pattern Rows 1 & 2 until 7cl group rows have been worked in all or work measures approx 9.5” from shoulder. of row. Turn. Rpt last row once. Turn. Next Row - Working into back loop of stitch only, 1ch, 1dc into base of 1ch, 1dc into each dc to end, ss to first dc on beginning of row. Turn. Working through both loops rpt last row once more. Turn. Fasten off. Work one row of crab stitch (see abbrev) in contrast colour, ss to first dc on beginning of row. Fasten off. Second Leg - With 4.50mm hook and main colour yarn. Return and rejoin yarn to same st at division were you divided for legs, continue on remaining st’s in the same way as first leg working last tr into last dc. Fasten off. Next Row - Make 1ch, 1dc into base of 1ch * miss 1dc, 2cl into next dc, miss 1dc, 1dc into next dc, * rpt from * to * to last 4dc, miss 1dc, 2cl into next dc, miss 2dc, ss to first dc on beginning of row. Turn. 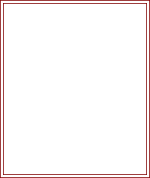 (7, 2cl groups). Next Row - 4ch, * (1dc, 2ch, 1dc) in between cl’s, of the 2cl group, 1ch, 1tr into dc, 1ch, * rpt from * to * to end, ss to 3rd of 4ch on beginning of row. Turn. Next Row - Working into back of loop, make 1ch, 1dc into base of 1ch, 1dc into each dc to end, ss to first dc. Turn. Working through both loops rpt last row once more. Turn. Fasten off. Join in contrast colour yarn and work one row of crab stitch. Fasten off. Button/Buttonhole Edge - With 4.00mm hook working on WS, work 38dc, evenly up left hand side, 3dc into corner, 1dc into each ch around neck edge, 3dc into corner, work 38dc evenly down right hand side to end. Turn. Next Row - (Buttonhole row) Work 1ch, 1dc into base of 1ch, 1dc into each dc to neck edge, 3dc into corner, 1dc into each dc around neck, 1dc into corner, * 2ch, miss 1dc, 1dc into next 6dc, * rpt from * to * until 5 buttonholes have been made, 2ch, miss 1dc, 1dc into each of remaining dc. Turn. Fasten off. Using contrast color yarn, work one row of crab stitch up first back edge, around neck and down second back edge working 2st in corners and 1st in each of the 2ch spaces. Fasten off. Chain Ties x 2 - With 4.00mm hook and contrast colour yarn make 126ch, ss into 2nd ch from hook, ss into each ch to end. Fasten off. Make 2 pom-poms (I used Clover pom-pom maker size 20) in contrast colour. Attach one end of each chain tie to on WS of button/buttonhole bands, thread chain ties through alternate tr's on last row of tr on yoke and tie in a bow at centre of front, sew pom-pom to each end of chain tie. ss to top of 3ch on beginning of row. Turn. Round 6-13 - 3ch, 1tr into each tr to end, ss to top of 3ch on beginning of row. Turn. Rpt Pattern Rows 1 & 2 same as rompers, 2 more times making 3cl group rows in all. Fasten off. Turn brim back onto RS of hat. With 4.00mm and contrast colour yarn work one row of crab stitch around and into loose loops on base of brim. Fasten off. Finishing - Sew in and tie off loose ends, attach pom-pom to crown. 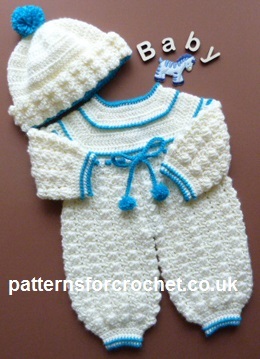 Hope you enjoy this free baby pattern for a rompers and bobble hat.